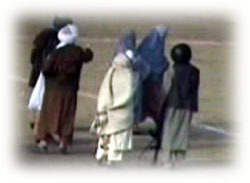 KABUL, Afghanistan (AP) - Thousands of people watched as a woman, cowering beneath a pale blue all-enveloping burqa, was shot and killed today in the first public execution of a woman in Kabul since the Taliban religious army took control three years ago. The woman, identified only as Zarmeena, a mother of seven children, was found guilty of beating her husband to death with a steel hammer as he slept. The reason for the killing two years ago was a family dispute," according to a Taliban soldier, who didn't give his name. 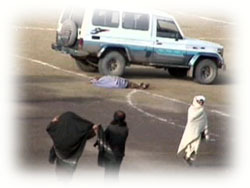 Zarmeena was taken from the back of a pickup truck that drove into the sports stadium. 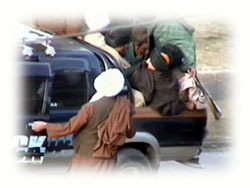 Two female police officers, both in deep blue burqas, held Zarmeena's arms. Witnesses said the convicted woman walked slowly, each step followed by a pause. When she reached the center of the field she was ordered by one of the women to sit. Behind her a young Taliban soldier, his head wrapped in the traditional turban, took aim with his Kalashnikov rifle. But suddenly Zarmeena stood up and tried to flee. A policewoman stopped her and forced her to sit, said witnesses. 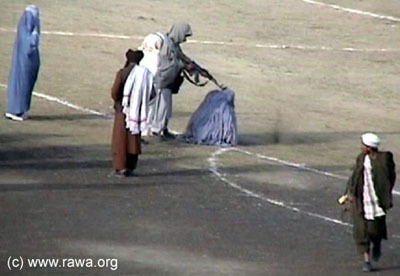 The Taliban soldier moved closer and shot her three times. Afterward from the crowd several people shouted "God is great." The stadium was packed with men and women, many of whom had brought their children. One woman in a burqa, who did not give her name, but was running quickly toward the stadium seats pushing her small children ahead of her, said: "This is the first time a woman has been killed. I wanted to see." Radio Shariat on Monday announced that there would be a public execution. 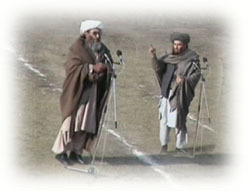 The Taliban have imposed their harsh brand of Islamic law in the 90 percent of Afghanistan under their control. The Taliban say their version of Islam is a pure one that follows a literal interpretation of the Muslim holy book, The Koran. 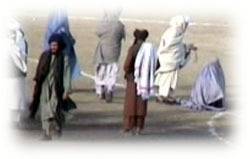 Under Taliban laws, murderers are publicly executed by the relatives of their victims. Adulterers are stoned to death and the limbs of thieves are amputated. Lesser crimes are punished by public beatings. Mohammed Wazay, who was collecting wood outside the stadium said that the woman, whose identity was not released on radio, "deserved to die because she must have killed her husband while he was sleeping, otherwise it's not possible." According to a RAWA reporter, Zarmeena's children and the family of Zarmeena's husband were present in the stadium and all of her children were crying loudly for their mother. 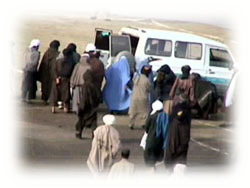 Several minutes before the execution, her husband's family announced to the Taliban that they forgave Zarmeena. But the Taliban said that it was impossible to stop the execution because they had already announced it to thousands of people. 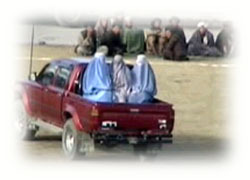 Islamic law allows the family to forgive the killer but the Taliban did not pay any attention to the law.